French Lessons Keep Singer's Legacy Alive American Carole Fredericks' soulful, bluesy voice made her a sensation in France in the 1990s. She died in 2001, but her songs are finding new life helping U.S. students learn the language Fredericks loved. 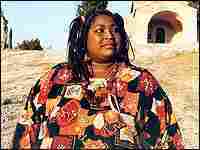 In France in the 1990s, Carole Fredericks' soulful, raspy voice and bluesy style brought the American singer a string of hit songs that made her a celebrity. The French called her "Black Mama," but her music never found a following in America. Fredericks died in 2001, but her work is now finding new life -- not on the radio, but in the classroom. Fredericks' family has teamed up with French teacher Nancy Gadbois to produce Tant Qu'elle Chante, Elle Vit (As Long as She Sings, She Lives). The study program combines workbook exercises with Fredericks' music videos to teach the French language. Brenda Tremblay of member station WXXI reports. * Songs from the CDs Carole Fredericks: Couleurs et Parfums and Fredericks Goldman Jones. Courtesy CDF Music Legacy. Below is a sample lesson from "Tant Qu'elle Chante, Elle Vit." Watch the music video below. Then, click on the links for workbook exercises. Note: Lyrics and exercises are easier to read once printed out.